I purchased this rug as a 3 by 5, for my bedroom. I was hoping it looked as nice as the picture and was happy to see that it did. I wanted something with character but also different and non traditional. This fit the bill. Its shag and really soft. Color was true to pic. This can go with a variety of styles and would recommend it! 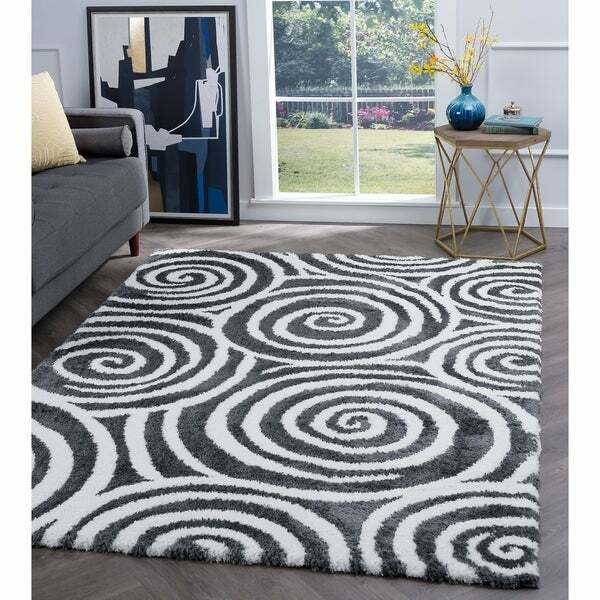 Soft Geometric Shag Grey and White Area Rug - 7'10" x 10'3"
Kitten-soft shag in a contemporary circles design offers amazing style and lavish comfort. Cozy microfiber pile area rug with jute backing delivers luxury feel at an affordable price. Vacuum on high pile setting to remove debris. Spot clean with mild detergent and water when necessary. Rug pad recommended. Exact Rug Size: 3'11'' x 5'3'' / 63 in. x 47 in.